The 4′ x 8′ Doubl Mat® Reversible Bed Mat & Slip Liner is the number one solution to bed lining and the only reversible bed-mat on the market. Loadhandler’s DOUBL-MAT® combines a ribbed rubber surface to reduce load shifting with a high density polyethelyne (HDPE) surface for easier loading and unloading. Unlike rubber bed mats that must be removed when loading and unloading heavy cargo, the DOUBL-MAT® HDPE surface allows you to slide your load, providing crucial bed protection when damage is most likely to occur. Important: If your pickup bed is rusty, or has a non-slip spray-in liner, you must have the DOUBL-MAT® (or similar slip-liner) in order to use the Loadhandler®. 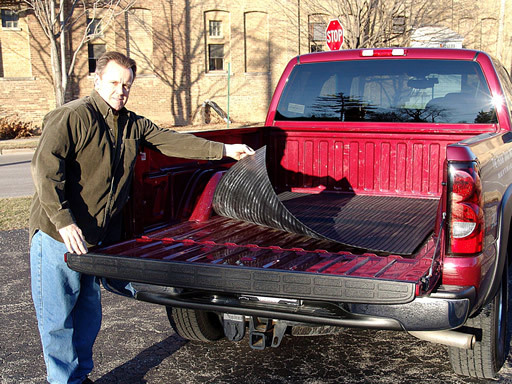 If your pickup bed is in good shape or you have a plastic liner, you do not need the DOUBL-MAT® in order to use the Loadhandler® (but may still want to use one). •The rubber side provides a non-slip surface to stabilize cargo. •The HDPE side provides a low friction surface that reduces the effort required to load/unload cargo. •The DOUBL-MAT® is ideal for use with all Loadhandler® pickup truck unloaders. •The DOUBL-MAT® HDPE surface reduces the Loadhandler® crank force and is ideal for trucks with damaged beds or loads over 1500 lbs.